But of course, unlike the deck-scrubbing corporal that I was, Mr Teo and Rear-Admiral (NS) Lui weren’t mere navy guys – they were the navy guys in charge of all other navy guys. Mr Teo was chief of navy when I completed my full-time NS way back when Paula Abdul was an actual American idol herself. Radm Lui was navy chief during my “operationally-ready NSman” phase except I didn’t know who he was at the time – that is, until he wasn’t going to be navy chief anymore. Six years ago, my ship’s coxswain called me up to ask if I wanted to go to a dinner. Our CO was paying for three tables at some navy event and the team, including myself, was invited to attend, probably as some sort of bonding exercise. I asked a fellow NSman at my table about some geeky-looking guy with the bad haircut and overbite at the event who seemed to be the centre of attention. “That's our chief of navy,” I was told. Even now, my image of a navy chief is someone who looks like Teo Chee Hean. And this guy didn’t look like Teo Chee Hean at all. Yah, sure, whatever. Was anyone eating the last mini springroll? The retiring navy chief went from table to table to personally say hi to everyone who was there, which I thought was a nice gesture. There might be a future in politics for this guy after all. And now he’s running MICA. This means – since I work for a newspaper which comes under the purview of his ministry – Radm Lui is my big big big big big boss once again, just like back in the navy. 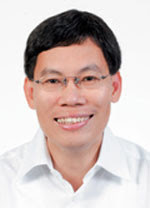 UPDATE: Mr Lui later became Transport Minister. He quit politics in 2015.